That’s the Rock Creek Alliance message as we enlists citizens to raise their voices against the Rock Creek Mine in a full page ad in the current Summer 2016 edition of Sandpoint Magazine. The ad is part of our ongoing efforts to raise awareness of the proposed mine. The ad points out the jeopardy to Lake Pend Oreille and Sandpoint, just downstream of the mine site. 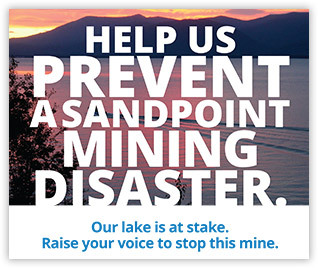 “Sandpoint has everything to lose and absolutely nothing to gain from this monster of a mine,” the ad concludes. The Forest Service’s Draft Supplemental Environmental Impact Statement for the proposed Rock Creek mine is up for public comment. The mine, if approved, will pose grave threats to water quality in Lake Pend Oreille just downstream, and have massive impacts on the Cabinet Mountains Wilderness. We have only until April 19th, 2016 to comment. Please, take action now!